Changes are to coming to the the British Music Embassy in 2020 but as no news about them has been made public, you’ll have to wait until next year (hopefully not that long?) to hear about them. What has been great in the 8 years in a row I’ve attended SXSW is the close proximity of Latitude 30 to B.D. Riley’s Irish pub, which has played host to Music From Ireland’s annual full Irish breakfast day showcase. As long as there’s no queue to get into either place, you theoretically could see 8 or more bands in a span of less than 3 hours. I tested out this theory again Friday afternoon in Austin. 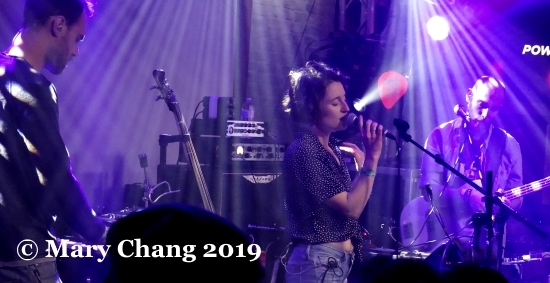 Following on from their energetic performance the night previous at Music From Ireland’s official evening showcase at the Velveeta Room, I was curious to see how whenyoung would fare when subjected to the sun streaming in from the open windows at B.D. Riley’s. Neither I nor the rest of the patrons at the Irish pub would be disappointed. And what better to enjoy emerging new Irish music than with a pint of Guinness? ‘Pretty Pure’ was emblazoned in red lipstick on the back of guitarist Niall Burns’ white jumpsuit at the Velveeta. 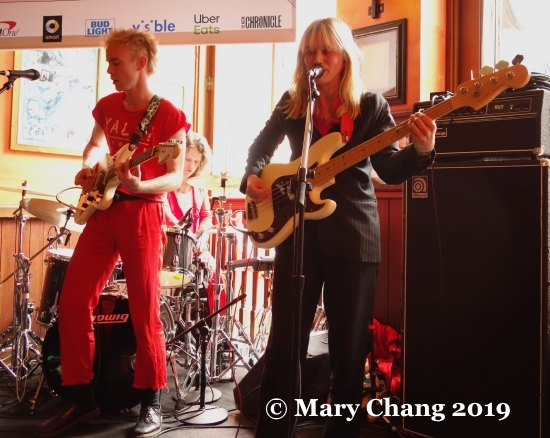 The song itself begins with a bright guitar note sequence reminiscent of the Vaselines’ ‘Molly’s Lips’ before continuing on in fine pop fashion. Their debut 7” with Felix White of the Maccabees’ YALA! Records is an energetic wonderful first taster to anyone new to the Limerick band. Bassist Aoife Power’s lead vocals have the duality of sweetness and dynamism, an interesting juxtaposition against an instrumental backdrop of fun and strength. Another fast-paced track, ‘Given Up’, is a workout for the senses, drummer Andrew Flood in his eyeliner hitting his skins like this life depended on it. I popped out after their set to check out Westerman at British Music Embassy. Sadly, the thoughtful, soft-singing London singer/songwriter whose first name is Will but goes by his surname was nowhere to be seen. His bandmate apologised that Westerman would be unable to perform. Based on this Facebook post, his SXSW appearances earlier in the week in Austin took it all out of him. Admirably, his bandmates soldiered on without him, one of them assuming lead vocal duties in his absence. Full marks there. I have to admit that I’m a purist and decided to duck back out, deciding I wanted to see him perform as nature intended in the future instead. Returning to B.D. Riley’s, I finally corrected a mistake made at Canadian Music Week 2016. Because of the large distances between venues in Toronto and suffering from a bad cold while in Canada, I missed Dublin’s Fangclub when they performed at the Music From Ireland show at the Rivoli. In hindsight, I think this was destiny. Phwoar. It wasn’t until after I became a music blogger that I truly realised the blessing in disguise I received as a child. Growing up in the presence of a much older brother who schooled me in the music of Led Zeppelin, the Who, Pink Floyd and Megadeth gave me an education that went beyond the British Invasion basics I’d researched on my age on my own before the age of 10. Later on in life, he gifted me with his 5-string ESP bass. In the context of my hard rock upbringing, Fangclub were a 21st century revelation. My favourite hard rock bands have always been those who can harness the sheer power of guitars and drums but direct them into a toe-tapping, headbangingly good time. Bonus points if the singer also sounds like he (or she) is shredding vocal chords. The blistering instrumental delivery of ‘Knife’, with Stephen King screaming “twist the knife” in the context of a romantic obsession…you had to have been there. As non sequitur this music was performed on a sunny, warm day in Austin, there is no denying the sheer testosterone-filled brawn of this band. Wipe your brow, son. I hung around at the pub for a bit longer to catch part of Kojaque’s set. After only a few bars of verse, I knew I was out of my depth when it came to the Dublin rapper whose name is pronounced but not spelled like the famous detective played by Telly Savalas. 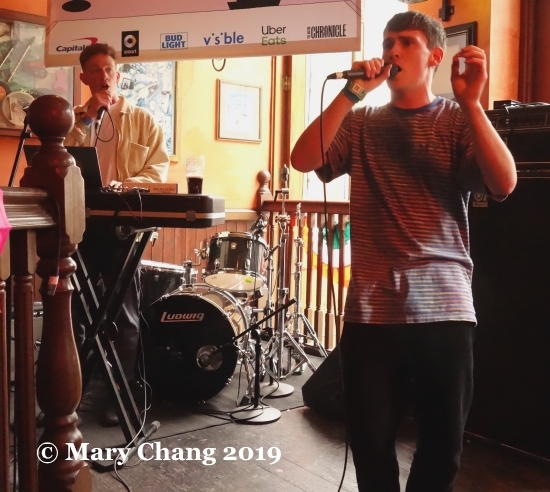 I have trouble providing a useful review of the Irish hip-hop artist, joined onstage by a smiley musical friend and some lounge-y backing tracks. Having made a new friend with a music lover from Newcastle, we agreed that this kind of music wasn’t made for people our age. Kevin Smith, I know you’ve got loads of adoring fans your age or younger and you must be extremely talented in both music and the visual arts. Sorry, this just isn’t for me. I must have been in the 0.1% of the music-loving world who had never seen Fontaines D.C. live up to this point. I’d been poked and prodded by friends for weeks leading up to SXSW, well-meaning friends who implored me to see them live. I’m no dummy. Music editors hear all the hype and unfortunately for hyped bands, unless I’ve heard about you independently of said hype, I am probably going to come to your show with a jaundiced editor’s ear. If you know me at all, you know I prefer to fight for the underdogs, the little guy. 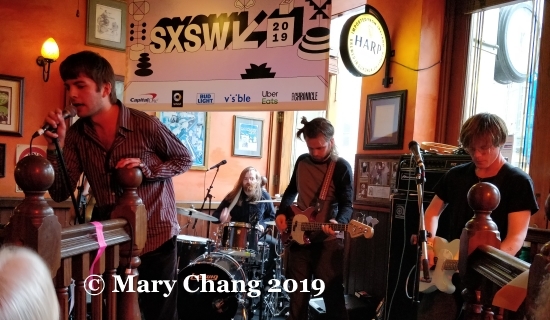 Fontaines D.C, who had been announced as IDLES’ North American support long before receiving their shout for SXSW 2019, fell into this category. Arriving with so much fanfare even before they stepped foot in Austin, I knew they didn’t need my help. Maybe it was where I was sat? They sounded loud, muddled and without anything that set them apart from the crowded current UK punk market. I sat through two songs before I’d had enough. Hey, I am nothing but accommodating! We could see Sam Fender and his band peeking his head through an open window. I’m not going to stay in a venue when people are just chomping at the bit to get inside. It was time to return to the British Music Embassy to rinse out the ol’ music editor ears. 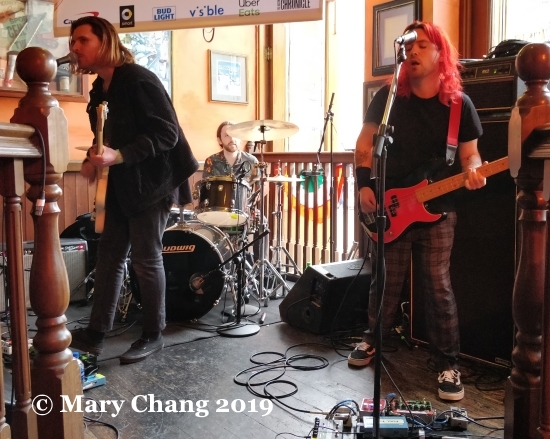 I’d seen SXSW 2019 TGTF Band to Watch Elder Island in the decidedly more clinical confines of the International Day stage on Wednesday, were set to close Latitude 30 for the afternoon. The Bristol trio who thrive on turning their music and everyone in the room on their head turned out another excellent performance. The sultry ‘Black Fur’, which is actually about singer Katy Sargent’s dearly departed late cat (tuck that piece of pub trivia away), was a bluesy tour de force. ‘I Fold You’, featuring their super cool electric cello, wowed their new fans, bopped heads and moved bodies. While I regret not having seen them at Bungalow that night at Majestic Casual’s showcase, I feel incredibly lucky to have seen them on Wednesday and at this show. Elder Island do Bristol and his rave-loving history proud.